For the past several months--ever since I started putting my back yard fence plans in motion back in May--I've been periodically checking the local humane society's website for interesting dogs that might keep Benny company after he retires. The problem I ran into was that they generally had only very tiny dogs (~15 pounds) or very large dogs (65+ pounds), but not much in the 20-35-pound range that I was trying to find. This past week, I saw that they had a cocker spaniel listed, which was on the large end of what interested me. I stopped by after work on Thursday to meet the cocker spaniel, but sadly he was more aloof than I preferred. (He spent half the time looking out the window rather than at me.) While I was there, I also met two other dogs. One was a pit bull puppy who was really adorable, but who chewed on everything. The other was an Australian shepherd who was larger than I wanted, but who had a mellow personality that I thought might work out well. I had a really tough time deciding between the shepherd and the border collie. What it came down to in the end was that the shepherd reportedly suffered from separation anxiety when left alone (which he would be every day when I went to work), and I saw him rip apart a stuffed toy (evidence of destruction he could cause if he put his mind to it). 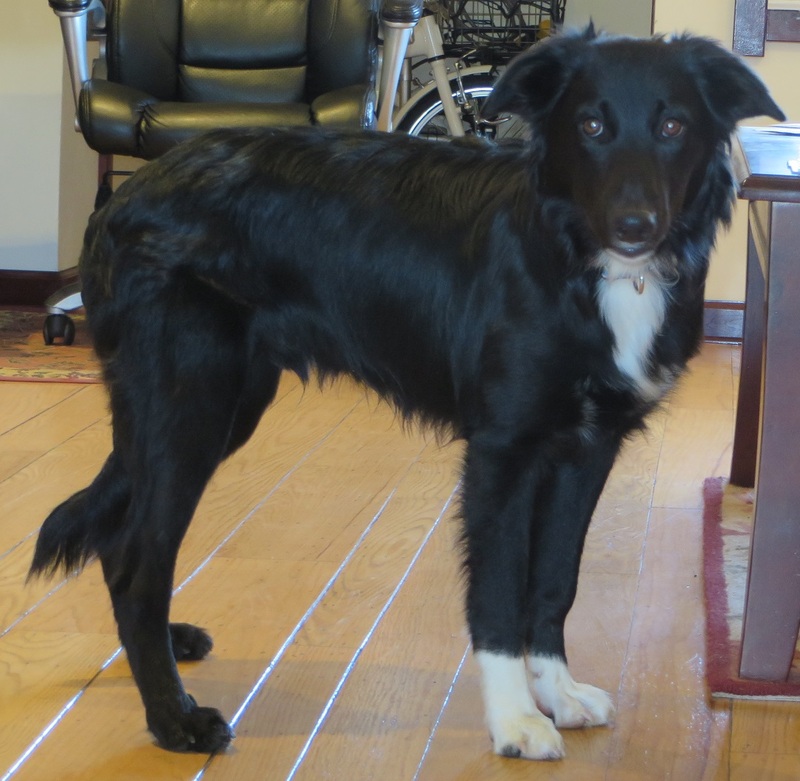 I ended up adopting the border collie, and I brought him home Saturday afternoon. He had been a stray in Fresno, and they think he's about 7 months old; that's pretty much the extent of what they knew about him. I made a quick trip to a nearby pet supply store to pick up some basics, and I spent most of the rest of the weekend hanging out with the new puppy. After giving his name some thought (they called him Swimmer at the shelter, but I didn't think that fit him well), I decided to rename him Rei (the Japanese word for "spirit" or "ghost"). Not only does it suit him with his little ghostly patch of white fur, I'm hoping that when Benny joins us, they will become good partners like Benton and Ray from Due South. He is a very sweet boy who really loves people and is friendly with other dogs. The neighbors had a football party on Sunday, and their guests brought three more dogs over. He had fun running around with all of them. He does have a few phobias to overcome--he's somewhat scared of doorways, and he's terrified of cars (even parked cars), so I haven't been able to take him for a walk around the neighborhood--but I'll be working with him on that. Anyway, he looks like a cutie. (Hee, we have matching pets.) Yay for puppy! Funny, Wednesday liked to chew on books (among other things) when she was a kitten, too! Hopefully Rei-chan will grow out of it. OMG, so cute! Congrats to you and new baby Rei!!! Benton and Ray! That's awesome. And he's a long-legged cutie. Welcome Rei! What a doll. Thanks! He loves people. And he loves licking. I practically get a bath every time I get home from work. So nice to have him in the family and to hear how well he gets along with the other dogs. He's just adorable.